Yesterday afternoon, people who rely on state funded health services had a chance to tell health department leaders face to face how they feel about around $12 million worth of those cuts, to things like day-to-day help for kids with special needs, home support services, therapeutic foster care, and dental and vision care. Sears, from Missoula, has a 15-year-old daughter with special needs who receives day-to-day help from Medicaid programs. Under the state’s current plan, those will be reduced. Sears works for MTPR. 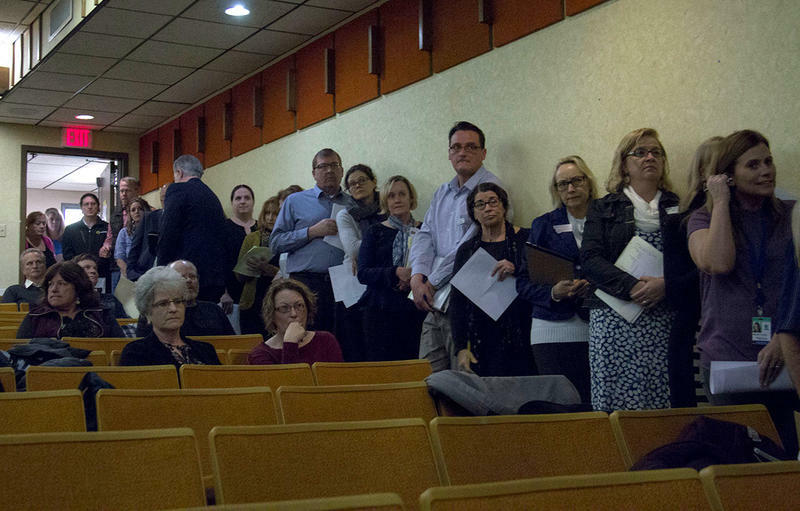 She was among the more 40 people who showed up to the public hearing. Another 50 called in to listen. 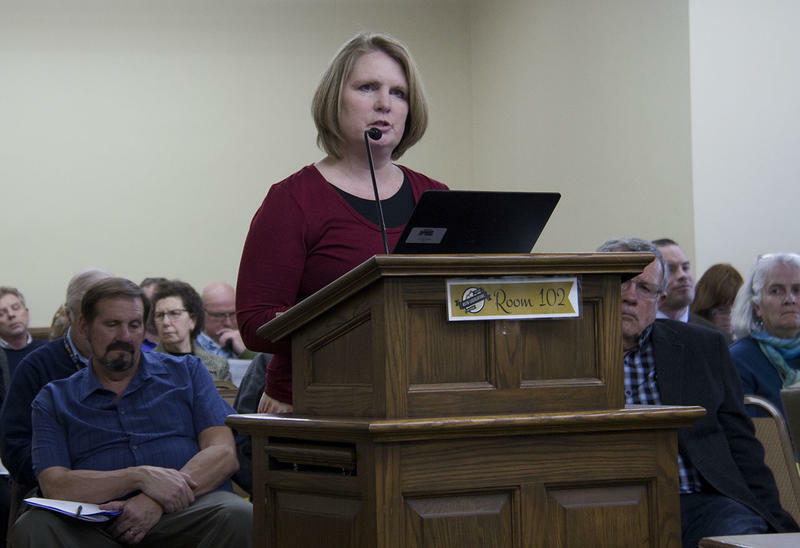 Before the three hours of public comment got started, Sheila Hogan, the health department director, and a Bullock appointee, said her department is bound by decisions state lawmakers made about how to balance the state budget. “We are seeing now the real life consequences of the Legislature’s budget decision," Hogan said. "In negations with legislative leaders leading up to, and throughout the special session, Republican leadership opposed any revenue increases, at all, while the governor made clear he did not want to make these cuts," she said. Governor Bullock proposed raising taxes on tobacco and people with incomes of more than half-a-million dollars a year to help backfill the state’s revenue shortfall. Republicans rejected nearly all of his money-raising proposals in 2017, saying that during hard times the state has to live within its means. Democrats and Republicans agreed in a special legislative session to prevent initially deeper proposed cuts to spending on social services. 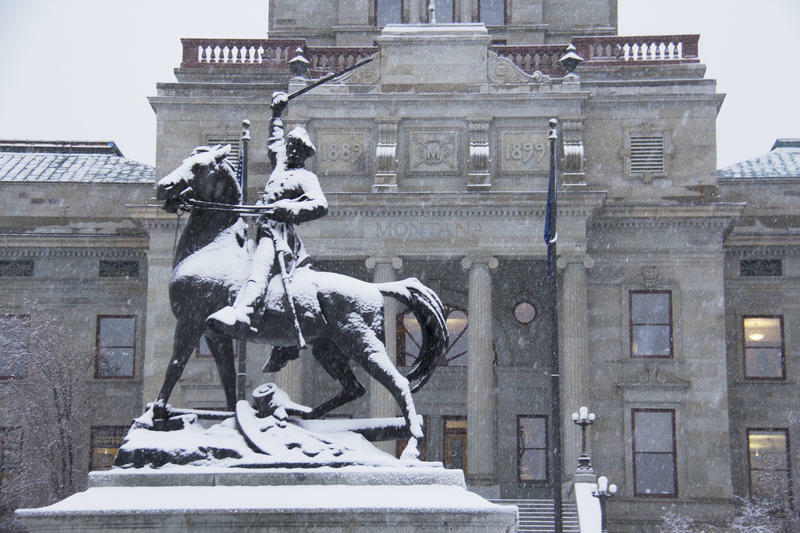 But at the end of the special session, both Governor Bullock and the Republican controlled Legislature signed off on cutting $49 million from the state health department, the biggest cut to any state agency. 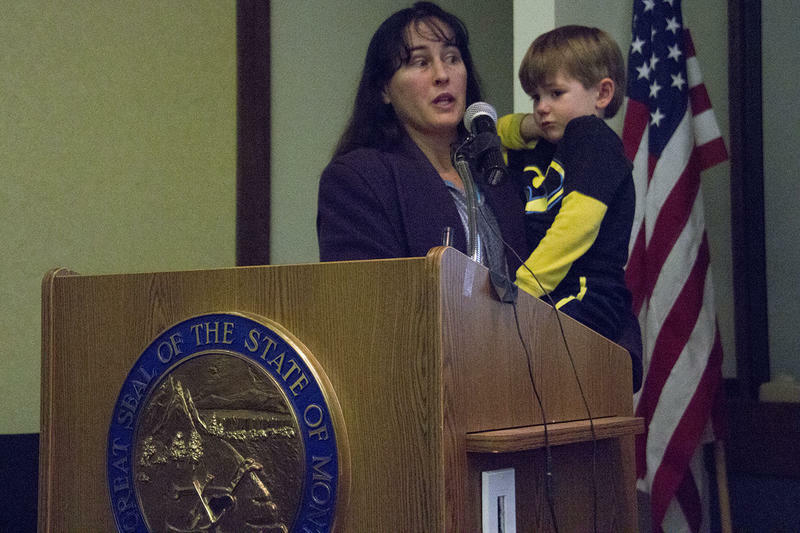 “This is so frustrating to me," Heather Gagnon said, holding her son on her left hip as she protested the health department reductions yesterday. She adopted three kids with social communication disorder, who she says benefit from therapeutic foster care and homes services funded by Medicaid. At Thursday’s hearing, people said that the cuts to health programs will ripple out across the state. Sara Heineman is director of health services at the Missoula city-county health department. Heineman, and others, asked the state health department to study the long term impacts, and costs, of the agencies’ proposed cuts. Heineman says cutting health care spending will increase homelessness, the number of kids in foster care, and the number of people who end up in the state’s jails and prisons. “How will these unaccounted increased costs impact individuals, communities, and the state budget in six months, in a year, in two years?" Heineman asked. The $12 million cut in state funding for the state health department programs discussed yesterday also means the state will lose a little more than $20 million in federal matching funds. Home support services and therapeutic foster care will be cut by nearly $900,000 over the next two years. 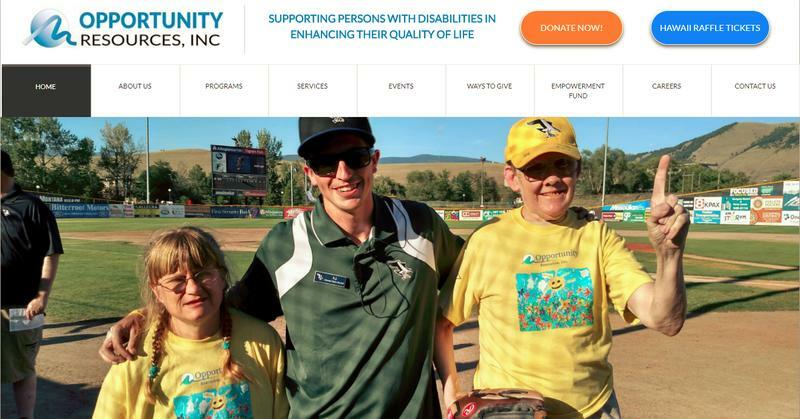 The total loss for day-to-day help for kids with special needs is more than $570,000. Hospitals across the state will see a $14 million reduction in how much they can bill Medicaid. Medicaid dental care is getting cut by more than $6.5 million. “This is going to cause some practices to lay off employees," David Hemion, the director of the Montana Dental Association told the department. He says the proposed cuts will hurt businesses as well as their clients. Public comment on the health department's latest proposal to get its spending in line with the budget mandate it was given from the special legislative session ends February 9. The health department is expected finalize its proposed budget cuts by August, at the latest. If the department doesn't formally do so within the next six months, it must submit a new proposal on how it will deal with the state budget cuts. In order to balance the state budget last year, Governor Steve Bullock and lawmakers signed off on $49 million in cuts to the state health department. The department’s response includes eliminating two-and-half-million worth of contracts to non-profits that serve people with developmental disabilities. A legislative committee on health care prices seems split on whether giving consumers more information about health care prices will make much difference. Last year Montana's Legislature set up a committee to study transparency in health care pricing, concerned that consumers don't have enough information about what health care procedures cost to shop for the best deals. And that means there's little incentive for providers to offer low prices.